Acoustic leak detection is a special type of service which uses non-destructive methods to detect leaks. 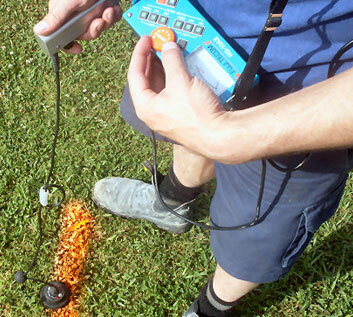 These non-destructive methods are also often labeled as acoustic leak detection since they consist of instruments that use ultrasonic sound waves to test and find leaks, these instruments are used alongside visual detection instruments that detect leaks in gas pipelines, water lines and oil lines without having to dig, or break anything. Once a leak has been detected there is a very small hole which is dug or a hole may be made in the wall in order to repair the leak, the repairs incurred are minimum. These types of detection methods are often useful in offices and homes where breaking the floor or tearing down walls can be very expensive and time consuming. Ultrasonic devices – These use ultrasonic waves to find leaks underground or leaks within concrete. Visual mapping devices – These are often used to draw a visual map of what is under ground or behind a wall in order to pinpoint the exact location of the leak. Specific detection tools - in addition to the above specific detection tools may be used to find specific types of leaks such as a gas leak detection tool may be used to find gas leaks etc. This type of detection is very accurate and is often used in conjunction with other acoustic leak detection devices. However, this type of detection is often used for finding water leaks since it has a 96% detection ratio and hence spotting defects becomes easy. This type of detection is often used to find leaks in the mains of a water line without a homeowner having to spend lots of money on digging up the entire pipe line. Sound testing is used in order to confirm the results from the first test, this works by listening to the pipes and the tanks in order to detect a noise caused by leaks. Sensitive and powerful microphones are used which are powerful enough for an engineer to be able to hear a blink of an eye and so it has no problems picking up noises such as the hissing of a gas line. But this type of secondary testing is usually used in situations where there is a gas leak. This works similar to how a medical ultrasound works, i.e. it gives out waves which then bounce back to the sensors on the device which helps it draw a picture of what lies beneath a floor or behind a wall. This makes it easier for engineer to find exactly where the leak is prior to making holes in the ground. The accuracy of this type of device is very good and can find leaks in cables, gas pipes, etc. The accuracy increases when used alongside the devices mentioned above.